A critical aspect of year-round highway maintenance is the removal of litter from shoulders and drainage systems. 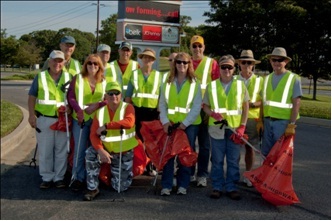 The Maryland Department of Transportation State Highway Administration (MDOT SHA) uses a multi-pronged approach to litter control utilizing MDOT SHA employees, State workers, and contractors, as well as labor donated through the Sponsor-A-Highway program and partnerships with Adopt-A-Highway volunteers. MDOT SHA also continues its public outreach to educate the public about the hazards of littering and its impact on the environment. MDOT SHA has taken several steps to “green” our litter removal efforts. Instead of just picking up litter, we now provide our crews and volunteers with the means to separate recyclables from trash. All seven of our districts currently recycle roadway litter in a formal manner. As our recycling efforts increase, the volume of waste taken to landfills continues to decrease.